Tai Chi is an ancient art that is sometimes referred to as "moving meditation". A Tai Chi form consists of a continuously flowing series of movements stressing balance, body awareness and connectedness, coordination, and circulation of life-expression force called "qi". Tai Chi Chuan can be translated to "Grand Ultimate Boxing" which gives a clue to its roots as a martial art, although most clubs promote the health benefits and anti-aging aspects of the practice. The beginings of Tai Chi are lost to myth and time, but the art was propelled to prominence when the imperial court of China invited Yang Lu-Chan to teach in Beijing in the 1800's. For a long time Tai Chi was a closely guarded secret art open only to close family and friends and by imperial fiat to the royal family and military elite. After the political upheavals in China, some of the great masters decided to open their teachings to a wider public. Playing Tai Chi trains a person to focus "in the moment" and so has the benefits of The Mindfulness Solution to Pain promoted by chronic pain consultant Dr. Jackie Gardner-Nix and Jon Kabat-Zinn, PhD., the developer of "Mindfulness-Based Stress Reduction". The postures and motions of Tai Chi encourage maximal but controlled stretching of the ligaments and joints, increasing general flexibility and relaxation. Qualities that diminish as we age. Tai Chi trains balance, coordination, proprioceptive and spacial awareness which minimizes the likelihood of falls and trains us to fall safely if a fall is unavoidable. One can find numerous articles supporting the benefits of Tai Chi for many specific medical conditions. 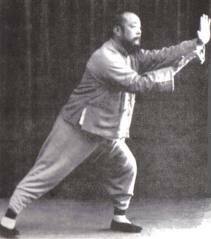 Beyond this, Tai Chi is a martial art that utilizes technique, balance, timing and leverage in its applications. It does not depend on muscle strength or brute force. I am a disciple student of Wu Kwong Yu who is the current gate-keeper and 5th generation grand master of Wu Style Tai Chi Chuan. I practice at the home club in Toronto, the website for which is listed under the "links" button. I also teach Tai Chi at the YMCA in Trenton, also listed under "links". I am available to offer private instruction at Wilderman Chronic Pain Clinic or other locations. My student, Diana Finch won a gold medal at an international open competition in China in 2004.